The theme of this article is a product called Forces of Nature Scar Control. This product comes in a liquid dropper format and has been formulated to reduce the appearance of scars. The manufacturer claims that this supplement can help to reduce scar tissue in one to three months depending on the age and severity of the scar. It can also help to treat skin discoloration, and also keloids which are the raised lumps that form within scar tissue. All the ingredients in Scar Control are derived from therapeutic grade plants and are certified organic. Marigold is widely used in homeopathic medicine to promote healthy skin and healing. Silica is used to treat painful scar and keloids (scar tissue), while mustard seed is said to actually help dissolve scar tissue. Everlasting Oil is said to relieve inflammation; rosehip seed oil relieves inflammation and promotes rejuvenation of the skin; and lavender calms the system. The sesame oil in the product help to achieve deep penetration of the active ingredients. The ingredients are all-natural, contain no toxins, no pesticides, and no chemicals. 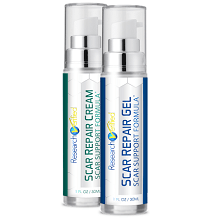 Rub 1 to 3 drops of Forces of Nature Scar Control directly onto the scar and surrounding tissue at least 3 times a day. No side effects are listed. 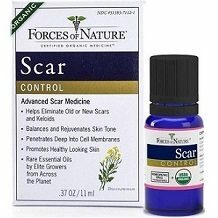 You can purchase a 4ml bottle of Forces of Nature Scar Control for $12.95. A larger 11ml bottle costs $25.95 and a 33ml bottle costs $59.85. Shipping is free if you spend $39 or more. There are no new customer incentives, nor bulk buying discounts. In terms of price, it’s hard to know how long a small bottle will last, but it seems that the initial purchase price is quite reasonable at $12.95. Larger volume bottles cost more but for long term use seem to be better value. Forces of Nature offers a generous one-year, money-back guarantee on this product but requires that you submit the original receipt along with the product. The refund excludes any shipping costs. If you purchased it from another retailer, Forces of Nature will not refund your money. We were pleased with a number of aspects of this scar tissue supplement. The ingredients are all-natural, contain no toxins, no pesticides, and no chemicals. There is a generous year long guarantee and return policy. Many competing scar treatment products are really just deep moisturizing creams, but this claims to actually heal scars. Forces of Nature says that this product is an FDA registered scar remedy and is certified organic. There is free shipping when you spend over $39. In terms of price, it’s hard to know how long a small bottle will last, but it seems that the initial purchase price is quite reasonable at $12.95. Larger volume bottles cost more but for long term use seem to be better value. There were weaknesses that we found about this product. As with most homeopathic preparations, there is no definitive research about the efficacy of the product or its ingredients. Shipping is only free when you spend $39 or more and we couldn’t find out from the company website how much regular shipping is. The guarantee is long but is unclear if you can return opened bottles of the product. There are no discounts for bulk buyers or incentives for new customers. There are not a lot of reviews on the company website for this product. For all these reasons we cannot recommend this product for treating scar tissue.